Last September I went to New York and lived in by CHLOE. – it’s a super hip, vegan/plant based restaurant that vegetarians and even carnivores can enjoy. 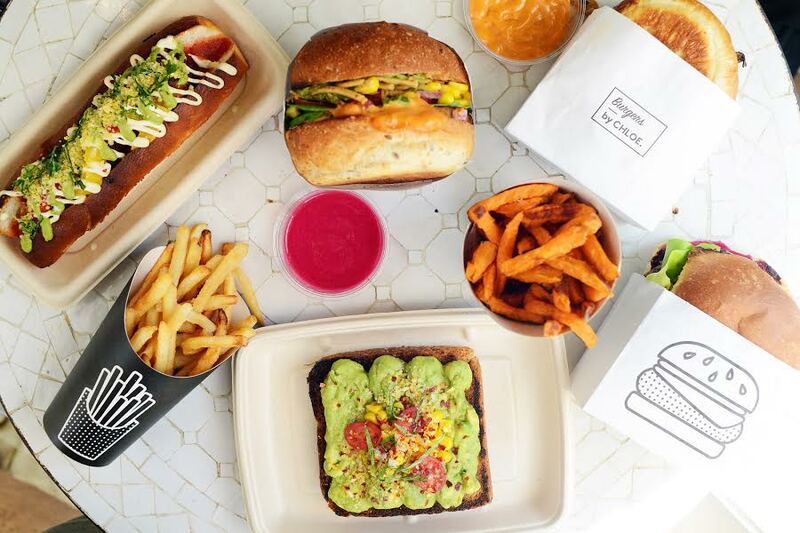 Offering animal free alternatives to American comfort food classics such as burgers, hot dogs and mac n cheese, it also does amazing salads, smoothie bowls and pancakes. The restaurant has already achieved cult status in the US and is a celebrity favourite. Their style is distinctive – the cute logo, stripes, clean and chic decor are so New York and their marketing is on point with the Instagram generation. Neon signs, slogans and cute illustrations make it a dream for those who like to snap their food and take selfies – there’s a photo op everywhere. by CHLOE. was awarded ‘best veggie burgers in NYC’ by Time Out New York; and named ‘2017 Top 100 Movers and Shakers’ by Fast Casual Magazine. It has now come to London’s Covent Garden (a 70 seat flagship restaurant) offering it’s signature salads, burgers, fresh pastas, daily-baked sweets (Sweets by CHLOE. ), dairy-free ice cream (Chill by CHLOE.) all of which are made in-house daily. The popular dishes include The Guac Burger, Quinoa Taco Salad, Air-Baked French Fries and Mac N’ Cheese along side the new British menu to celebrate its arrival in the UK. To mark its arrival to the UK, by CHLOE. has introduced a series of exclusive menu items “London by CHLOE.”. Taking inspiration from quintessential British dishes, the restaurant will offer a plant-based, vegan take on Classic Fish N’ Chips, Shepherd’s Pie, Pea N’ Ham Soup as well as Sticky Toffee Pudding. I was lucky enough to go to the launch last night and believe me, the vegan Fish N’ Chips (tofish) was delicious! A crispy outer shell contains a silky tofu centre resting on thin slice of seaweed Nori which totally makes it look like an actual fish! Once you bite, you know you’re eating tofu, but boy it sure does taste like cod. It’s SO good and a must try. I do actually eat fish but would give it up for this as an alternative. I had mini sized portion of everything last night and other highlights were the Mac N Cheese, Sweet Potato Fries and the Quinoa Salad which tasted like it contained bacon. The cakes were a disappointment but I’ll have to go back to check them out when I’m not drinking prosecco and eating burgers. When I found out by CHLOE. was coming to the UK, I was worried that the London restaurant wouldn’t have the same vibe as New York, but it felt the same as my holiday last night, it was amazing! The decor is super cool and they even have the swinging chairs. I am so glad by CHLOE is here! Unlike most specialist plant based eateries, this is accessible to the masses, meaning you don’t have to wait in a super long queue in the depths of Hackney, where you eat your meal on a freezing bench, or standing outdoors in the rain. While I was in New York, my favourite by. CHLOE meals were their breakfast offering – they do a killer breakfast! We had smoothie bowls, quinoa hash browns, chickpea scrambled eggs, pancakes … it was insane! I’ll have to try the breakfast here and report back to you.